On April 28 1908, in St Gertrudes Cathedral, Utrecht, Arnold Harris Mathew was consecrated Regionary Old Catholic Bishop for Great Britain and Ireland at the hands of Dr Gerardus Gul, Archbishop of Utrecht, assisted by Mgr James John van Thiel, Bishop of Haarlem, Mgr Nicholas Bartholomew Peter Spit, Bishop of Deventer, and Mgr Joseph Demmel, Bishop of Bonn. This marked the beginning of the Old Roman Catholic Church in GB. Since then, we have had six other Archbishops and the Headquarters of our Church have been in a variety of places, usually where the then Archbishop actually lived. 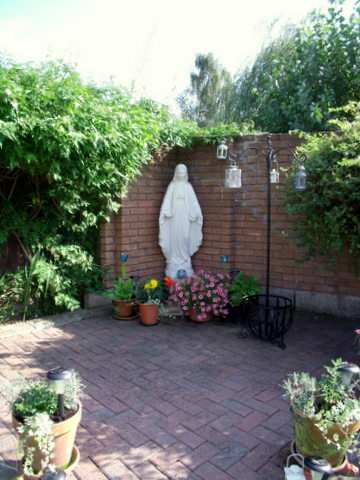 In December 2011 the Trustees of the Church took the decision to move from North London and to establish our HQ in Gosberton, where we were able to purchase a large house in its own grounds which will become both a home for the Archbishop and his Coadjutor and their families, as well as a focus point for all the other Priests and Laity of the Church where they will all come at various times for a time of reflection, quiet and refreshment. Here also take place the extraordinary services of the Church that require the place of worship that we have created - the Episcopal Chapel. Here the Archbishop has his Cathedra or Throne, from which he exercises his leading and teaching role as the senior Bishop. In this Chapel also take place the ordinary round of the services of the Church, set down many centuries ago. So it is that every morning and evening the Offices of the Church, Lauds and Vespers, are said, whilst on a number of occasions during the week Holy Mass is offered. With regards to this, we worship in a traditional form, using the old Rite of the Offices and Mass which were found in all Catholic churches until the time of the Second Council of the Vatican in the 1960s. Here in Gosberton we use English in preference to Latin, but in the other Missions of the Church, either is used according to the wishes of the local congregation. We are, you see, a Church that always listens to its Laity in order to lift their souls to God. Whilst we worship in a traditional manner, we are nonetheless an inclusive Church, welcoming all and turning none away. It has long been the role of our Church to cater for those who have no connection with other Churches, or whose connection with other Churches has temporarily broken down. Our clergy are from a variety of backgrounds; some now retired after long and active careers in areas such as teaching and Government service. We are also fortunate enough to have, as part of the Church, a small but vibrant community of Benedictine Monks, who devote their lives to prayer and the service of the needy. Whilst our Chapel is not a public place of worship, you are always welcome to join with us. To find details of our services please feel free to be in touch with Bp Howard on 01775 841025 or to email him on: coadjutor(AT - use the usual symbol)oldromancatholic.org.uk.